THIS IS AN ADDON PACK FOR THE IMMERSIVE RAILROADING MOD. IT DOES NOT CHANGE STOCK TEXTURES. At last, modern North American passenger stock is realized in Minecraft. This pack aims to add modern standard-gauge stock for an Immersive Railroading system. Why "Amtrak+?" 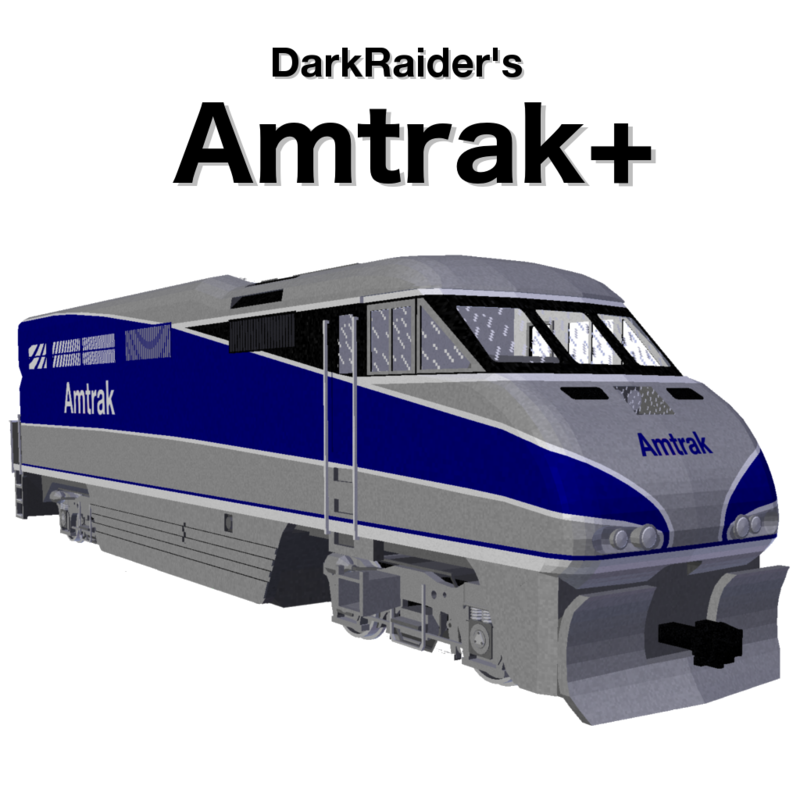 Originally, I developed the pack exclusively for Amtrak Superliners, however, as I became more active in the IR Community, I received requests for other stock. As this is added, I will update my list. On some curves, the cars may appear to separate. This is an artifact of how IR handles coupling on curves and cannot be fixed without an update to the mod. To minimize these issues, use a larger radius as specified above for your curves. For the interior, I reduced the number of seats abreast from 4 to 2, due to the wide nature of a Minecraft player or villager. Under no circumstances may any content in this pack be reproduced or modified and publicly distributed without explicit permission from the author, DarkRaider. Usage of this pack for profit or monetary gain of any type is strictly forbidden. By downloading this pack, you agree to these terms and conditions. All logos and names used are property of their respective owners. Amtrak California, and the Caltrans logo are properties of the California Department of Transportation. Amtrak, Pacific Surfliner, Amtrak Cascades, and the Amtrak logo are properties of the National Railroad Passenger Corporation. Ford, F150, The Ford logo, and F150-likeness are properties of Ford Motor Corporation. The "Superliner I" car design is a property of Pullman-Standard. The "Superliner II" car design is a property of Bombardier Inc. The "F59PHI" design is a property of Electro-Motive Diesel Corporation. The "Talgo 8" car designs are properties of Patentes Talgo S.L.U. Do I just put the whole zip file in my mod folder or do I have to do something with it? That's not a pack specific error. It's usually attributed to assets being removed from memory (RAM) before they are needed by another process. I have discovered today that my SketchUp models were stolen by Lachie for his/her resource pack. What can I do about this? Which models do you believe are stolen? And where's the link to them. It doesn't appear I can give you the links. Curseforge deemed my message "spam". I'm assuming it was the F40PH and Comet? And the multilevel coach, but don't worry. This issue has been solved as of a week ago. Would it at all be possible to add a P40DC and two F40PHs (One Phase V and one Downeaster), and an Amfleet coach to this pack? No. Legend already has a P42DC in his American Diesels pack and Lachie already has an F40PH in his passenger pack. I don't get it, is this a texture pack or a mod add-on? Did you check the Locomotives tab?